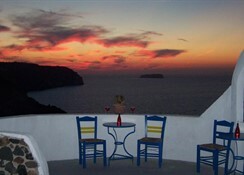 Caldera View is located in a quiet setting between the traditional settlements of Megalochori-Akrotiri, 70 metres from the cliffs of Caldera. The hotel offers one of the biggest swimming pools on the island, with hydro massage and waterfall.The Cycladic Style and colors on the exterior and interiorof the hotel reflect synonymous of the Aegean sea with its calm, peaceful and relaxed atmosphere.The View CafÃ© & Bar Restaurant is an ideal place to relax and take in beautiful and unique sunset while enjoying refreshing drinks and delicious traditional Creek cuisine.Caldera View is only 7 km from Fira Town and the Airport, 3 km from the port, 2 km from Ancient Ruins and the famous Red Beach and 1 km of Megalochori, a convenient location from where to get started on sightseeing with a bus stop right outside the hotel. 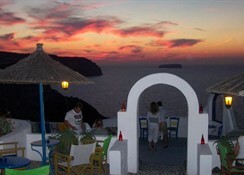 The resort is also very close to Akrotiri with its ancient ruins and the famous unique Red Beach.